Hello there, I am sure I have told you in the past that I struggle to come up with ideas for cards for men. Younger boys? no problem but older males? not so much. I find it is ok if they like sports, beer, fishing etc. but if they do not, I find it difficult to come up with generic ideas. I came across a card by Laura Bassen that I thought could be adapted to a birthday card and would be great for men. For the card, I started off with a piece of white cardstock. 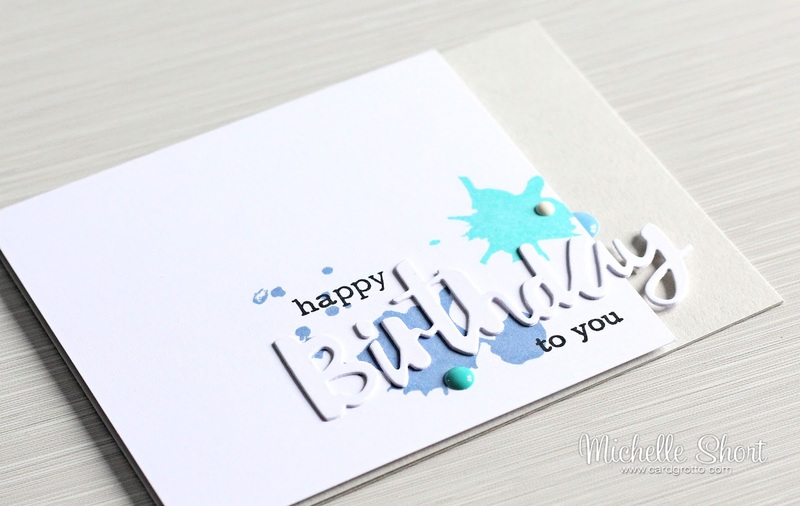 I took the Ink Splats stamp set from WPlus9 and stamped two of the splats on to it using MFT dye inks. I then stamped the 'happy' from the CB Happy Birthday stamp set and the 'to you' from the CB Congrats To You stamp set with black ink. I die cut the SSS Painted Happy Birthday die twice from white cardstock and layered up the birthday word. I took the white stamped panel and adhered this to an A2 Fog card base with foam sheet. The die cut word was then added on top (adding a little foam tape behind the 'y'). To finish off, I added some Doodlebug Sprinkles. I am very glad to have another male card in my card box! Thanks so much for visiting me today. I hope you have a great weekend! Great card masculine card, Michelle! Thanks for the inspiration! 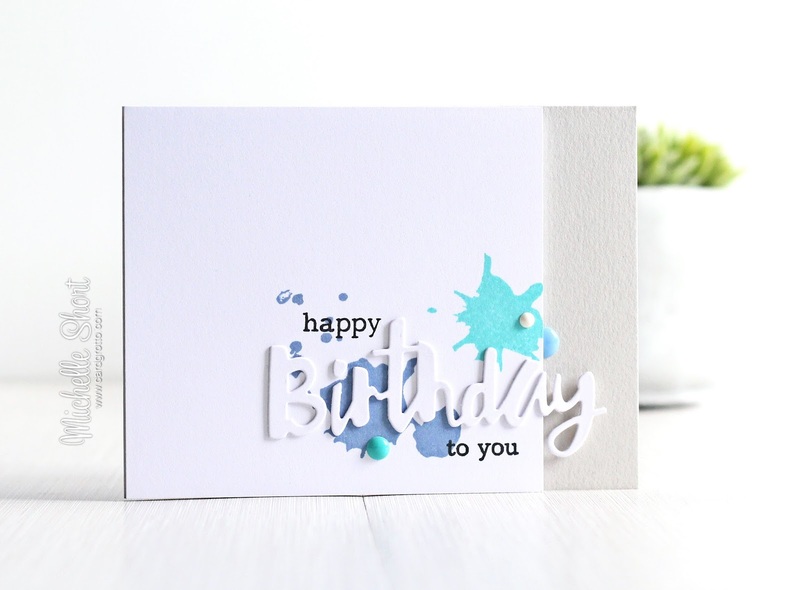 Great card Michelle, love the colours you have used for the paint splatters and that birthday die is fab. I always love your cards because sometimes they are simple and beautiful. This is one of them. This Ink Splats stamp set is on my wish list. Thanks for sharing. Fabulous!!! Love the design and your color choices! Perfect for a masculine birthday card!!!! I love this card, I might just have to "borrow" one or two ideas from it!